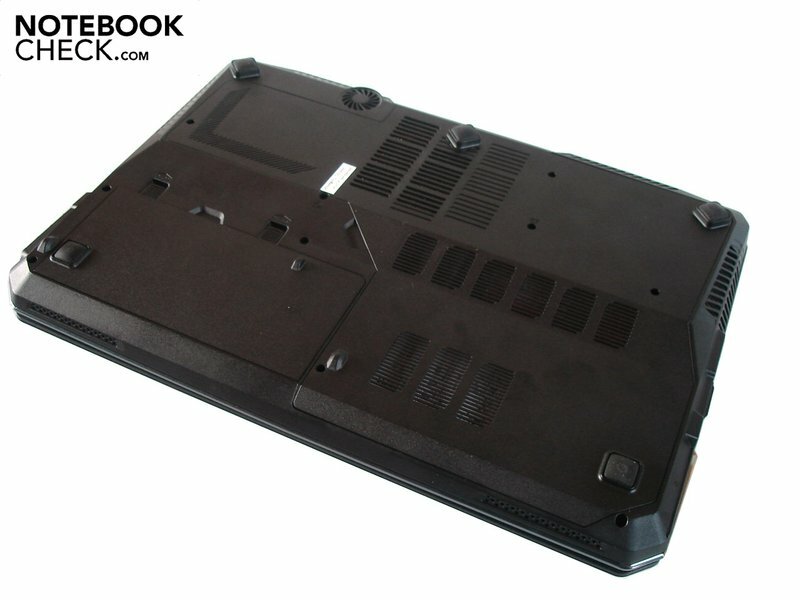 The manufacturer, MSI, has always known how to squeeze high-performance components into the limited room of a 15 inch case. The GT663R is perfect evidence for this. 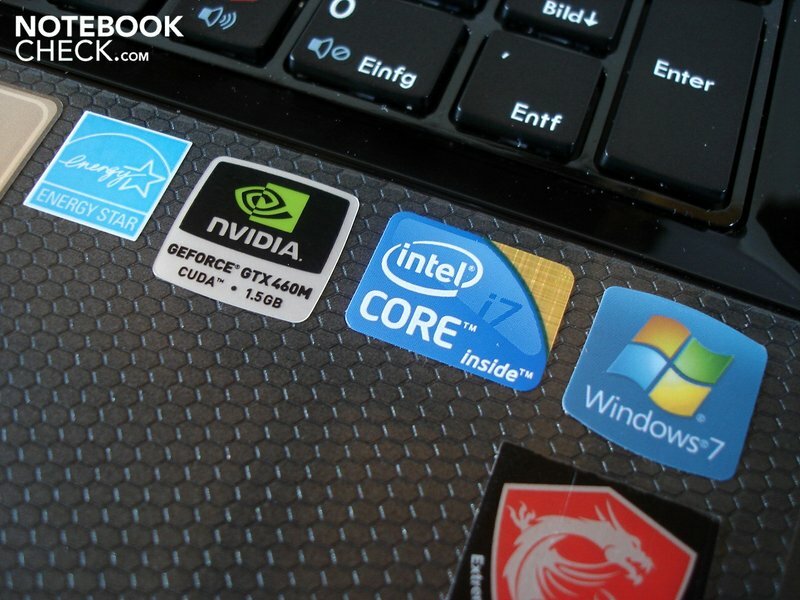 In addition to a fast Intel quad core processor (Core i7-740QM), the gaming notebook is equipped with a high-end graphics card from Nvidia. The GeForce GTX 460M is DirectX 11 suitable. But not only gamers, but also movie fans are taken care of. 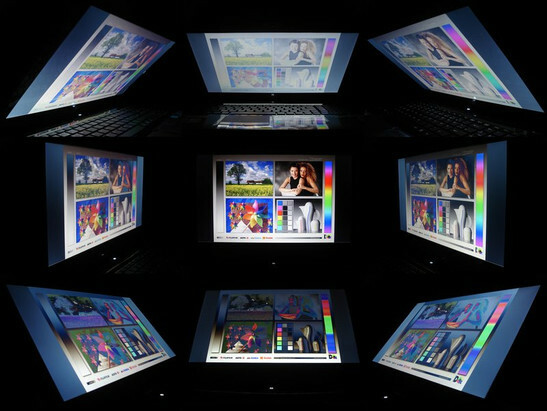 The installed FullHD display can develop its full potential due to a BluRay drive. The three currently available models only differ in the RAM capacity and hard disk configuration. 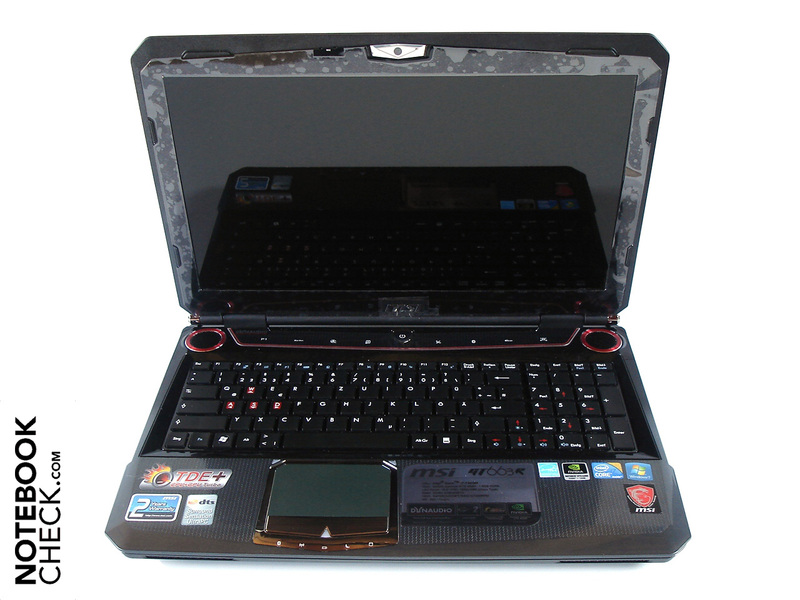 The GT663R-i7468BLW7P that costs 1500 euros has a six GB DDR3 RAM (3x 2048 MB) and two 320 GB HDDs. 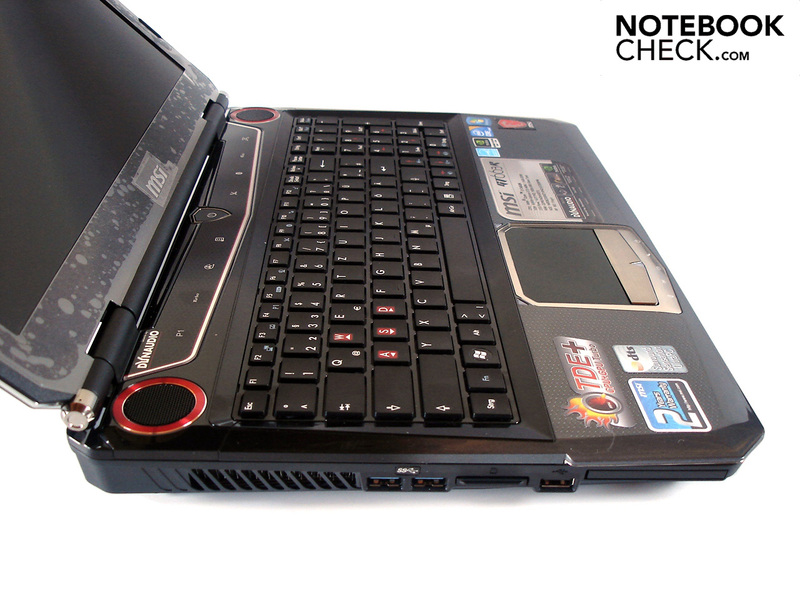 The GT663R-i7488BLW7P we've tested costs 1600 euros and serves with an eight GB DDR3 RAM (2x 2048 MB). Then again, MSI charges a superior price for its top model. The buyer has to cough up an additional 300 euros (1800 euros) for 12 GB of DDR3 RAM (3x 4096 MB) and a hard disk capacity of 1000 GB (2x 500 GB). We omitted the sections that describe the GT663R's "Case", "Connectivity" and "Input Devices" because we have already had this casing in review three times before (MSI GT660R, MSI GX660R & Medion Erazer X6811). As mentioned in the beginning, MSI has given the GT663R a 15 inch FullHD display. A resolution of 1920x1080 is fairly high considering the display diagonal of 39.6 cm. However, such a resolution is appreciated when several windows have to be managed at the same time (see screenshot). Beyond that, an aspect ratio of 16:9 complies with the current standard. Regrettably, MSI has forgotten to buy a higher quality display. Thus, the installed AU Optronics B156HW01 screen can't surpass an average level. It starts with the black value of 1.26 cd/m2, which is fairly high. In particular dark sequences in games and movies don't appear deep black, but have a noticeable gray cast. The contrast is also more than disappointing. Poor 178:1 is far from other screens, such as the Hannstar HSD173PUW1 (e.g. 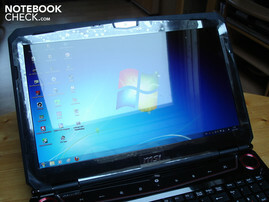 Asus G73JW). Merely the brightness doesn't have to accept reproach. An average of 235:1 stands for an agreeably bright picture. 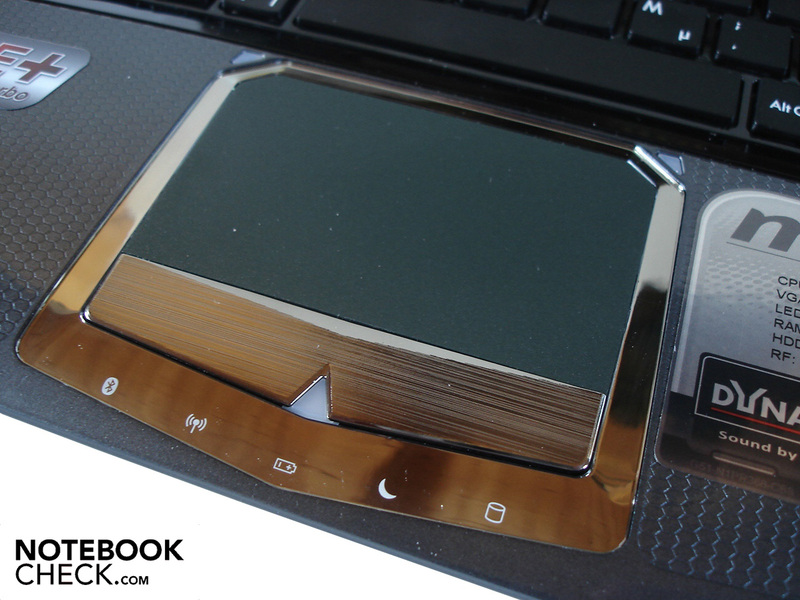 A decisive drawback of the glossy display surface is the high inclination for reflections. If you don't take care to choose a perfect place, you'll see yourself faced with annoying reflections in the daytime even indoors. The GT663R is hardly suitable for outdoor use despite its good brightness. The eyes are stressed massively in direct, as well as indirect sunlight. The viewing angle stability is also not one of the GT663R's strengths. The slightest deviations are enough to falsify the content, in particular on the vertical plane. If you add up all single points, you quickly conclude that MSI has definitely saved money in the wrong place. The poor display quality visibly dims multimedia entertainment. 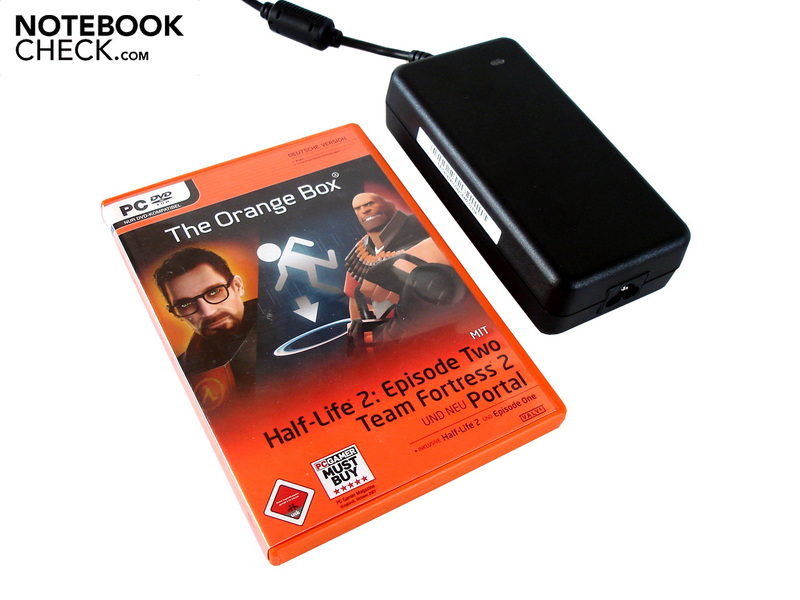 If possible, the user should use an external monitor for games and movies. Although Intel's new processor generation, code named Sandy Bridge, is already in the making, the GT663R has to be content with the "old" Clarksfield range. The Core i7-740QM is a strong quad core processor that is manufactured in a somewhat outdated 45nm process. It has a maximum power consumption of (relatively high) 45 watts. The Core i7-740QM not least owes its good performance to the 774 million transistors and the six MB sized L3 cache. The standard rate of 1.73 GHz won't knock anyone off their socks. However, the clock rate is increased up to 2.93 GHz (depending on the temperature and load) with the Turbo Boost function. Beyond that, the technology called Hyper Threading allows the Core i7-740QM to process eight whole threads at the same time. Even if it's still not a benefit for games, it has a great impact on multi core optimized programs. Now to the CPU-biased benchmarks, where the Core i7-740QM doesn't have a chance against the new Sandy Bridge processors. The higher clocked Core i7-2720QM (Asus N53SV), for example, is superior by a whole 28% in Cinebench R10's single core rendering (from 4065 up to 5215 points). This advantage even increases by a remarkable 67% in multi core rendering. The Core i7-2720QM takes the lead with 19061 against 11386 points. Cinebench R11.5 also turns out in favor of the Sandy Bridge CPU with 5.64 against 3.34 points (+69%). To live up to the gaming claim, a high-end model from Nvidia serves as the graphics card. The DirectX 11 apt GeForce GTX 460M still counts as one of the fastest mobile representatives in 2011. The GPU contains a 1536 MB GDDR5 video memory beside 192 unified shaders. It's sufficiently tethered to 192 bits. The GeForce GTX 460M settles at 675 MHz (core), 1250 MHz (memory) and 1350 MHz (shaders) in regards to the clock rates. Nvidia's scope of supported features is currently unmatched. While PhysX and PureVideo HD correspond to GPU based physics respectively (HD) video acceleration, a stereoscopic 3D playback is possible via 3D Vision (requires a 120 Hz monitor and according kit). The GT663R doesn't have the dynamic graphics switching, Optimus, because the Core i7-740QM lacks an incorporated graphics chip. The GeForce 460M is otherwise sooner found in 17 inch devices due to its high waste heat and its high power consumption. A unique feature of the GT663R is the so-called Turbo Drive Engine (or short: TDE). This function overclocks the CPU and GPU that can simply be disabled/enabled via a button. As you can see on the right screenshot, the GeForce GTX 460M's core rate is increased to 709 from 675 MHz and the shader rate from 1350 to 1417 MHz (+5% each). Our experience has shown that the Core i7-740M clocks faster by about 100 MHz. Turbo Drive Engine has a rather minor impact on the speed. The performance increased by only just 4% in 3DMark Vantage (from 7518 to 7804 points). Note: All following application and gaming benchmarks were executed with Turbo Drive Engine. 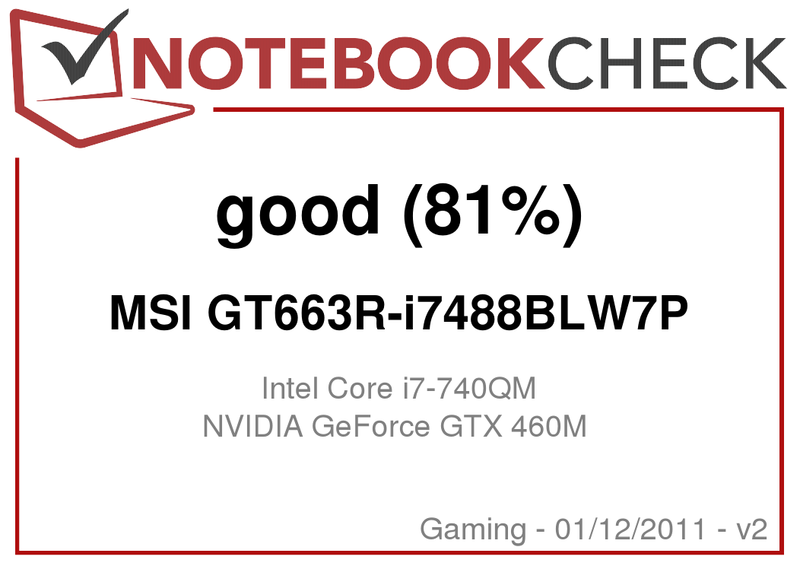 The MSI GT663R was very impressive in the GPU-biased benchmarks. The GeForce GTX 460M's excellent DirectX 11 performance was not least visible in the Unigine Heaven 2.1 benchmark. 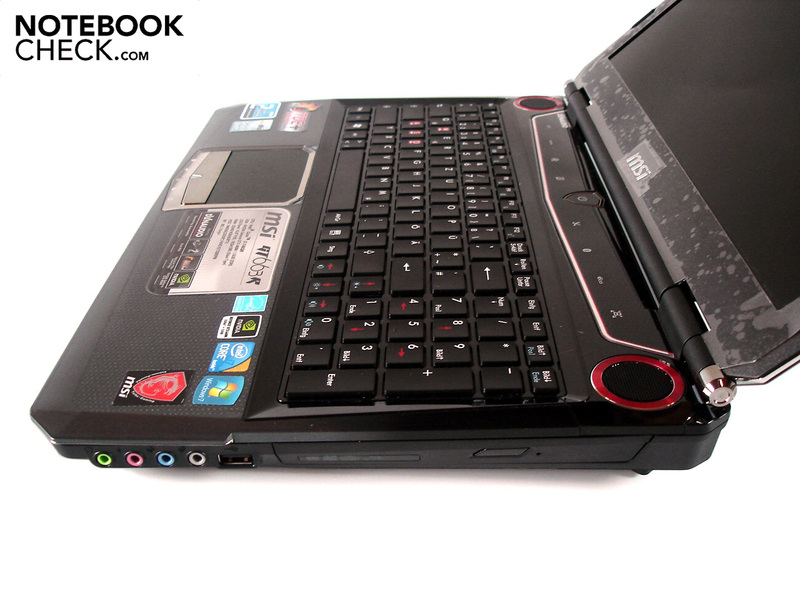 The main opponent from AMD, the Mobility Radeon HD 5870, is left behind slightly (MSI GX660R). Then the tide turns in the 3DMark Vantage (DirectX 10) GPU score. The Radeon places itself in front of the GeForce GTX 460M by about 9% (7616 against 6988 points, Medion Akoya X7811). MSI has opted for two Western Digital HDDs with 320 GB each (WDC WD3200BEKT-22KA9T0). Since both hard disks rotate with a speed of 7200 and, beyond that, are set up in a performance boosting RAID 0 mode, the system scores with an excellent average transfer rate of 142.3 MB/s (HD Tune). The sequential read rate of 142.0 MB/s and the sequential write rate of 152.7 MB/s don't have to hide behind this result (CrystalDiskMark). 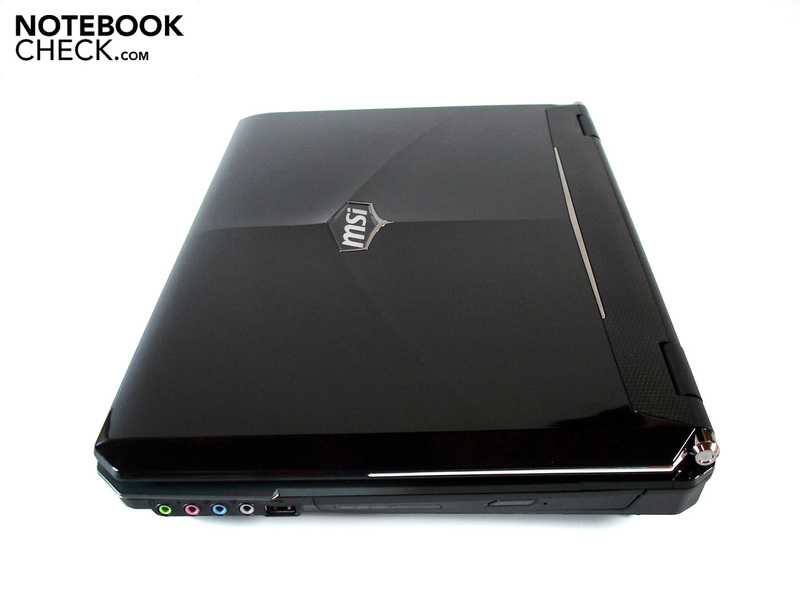 The MSI GT663R's application performance has a very high standard. The combination of a quad core CPU, a high-end GPU, an eight GB RAM and two fast HDDs in a RAID 0 array doesn't surrender even with the most challenging tasks. The user is adequately provided for with the according system for several years. In order to extract even more performance, MSI will have to release a refresh with the new Sandy Bridge processors in the future. 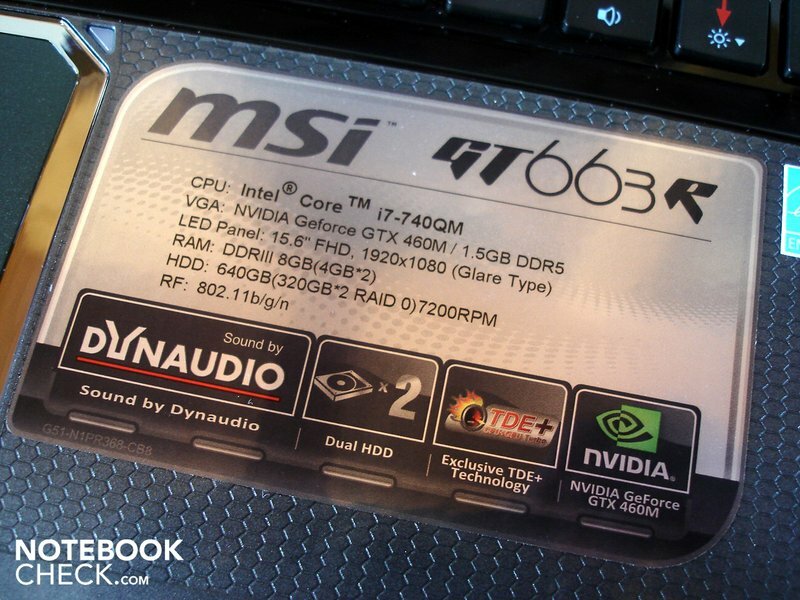 We checked the MSI GT663R's gaming performance with several, current games. As in the graphics benchmarks, the GeForce GTX 460M once again has to compete with the Radeon HD 5870 (DevilTech HellMachine). To keep the CPU's influence as low as possible, we will only deal with the results in the native FullHD resolution. The developer, Treyarch, has actually managed to give the newest offspring of the Call of Duty sequel a fairly reasonable story. Unfortunately, a sufficient optimization of the graphics card has been forgotten in return. The result: As in many other devices, massive stutters turned up during the benchmarks – regardless of the selected setting. Basically, the GeForce GTX 460M would be fast enough for Black Ops. We determined an average of 47.2 fps in very high settings, 4x AA (antialiasing) and 8x AF (anisotropic filtering). The latest Nvidia GPUs get along particularly well with one of last year's most successful games – the football simulation Fifa 11. The GeForce GTX 460M supplied excellent 130.0 fps even when high details and 4x AA were used. The corresponding settings also run extremely smooth on a Radeon HD 5870. Nevertheless the ATI GPU calculates slower by a whole 31%. Although Mafia 2 doesn't meet up to the expectations set on it in gaming, there's nothing to complain about in terms of graphic quality. The GeForce GTX 460M felt very comfortable even in high details and 16x AF with the integrated benchmark. An average of 34 fps is still within the range of playability. The Radeon HD 5870 only has a weary smile for this result. It beats the Nvidia by 18% with 41.1 fps. Although Starcraft 2's graphics is anything but breathtaking, the real-time strategy hit requires quite a bit of computing power in higher resolutions and quality settings. If there aren't too many units running around on the display the GeForce GTX 460M doesn't have any problems with very high details, either. We determined good 31.4 fps in the intro of the challenge “For the Swarm”. StarCraft 2 runs a bit smoother on the Radeon HD 5870. 37.2 fps is an advantage of 18%. In the first-person shooter, Metro 2033, exorbitant hardware requirements bring the GeForce GTX 460M to its limits. The game stutters so intensely in high details, the DirectX 11 mode, AAA (analytical antialiasing) and 4x AF that the benchmark could only be completed with effort (19.3 fps). The Radeon HD 5870 is superior to the GeForce GTX 460M by about 17%. 10.9 fps are still far from an acceptable game play though. 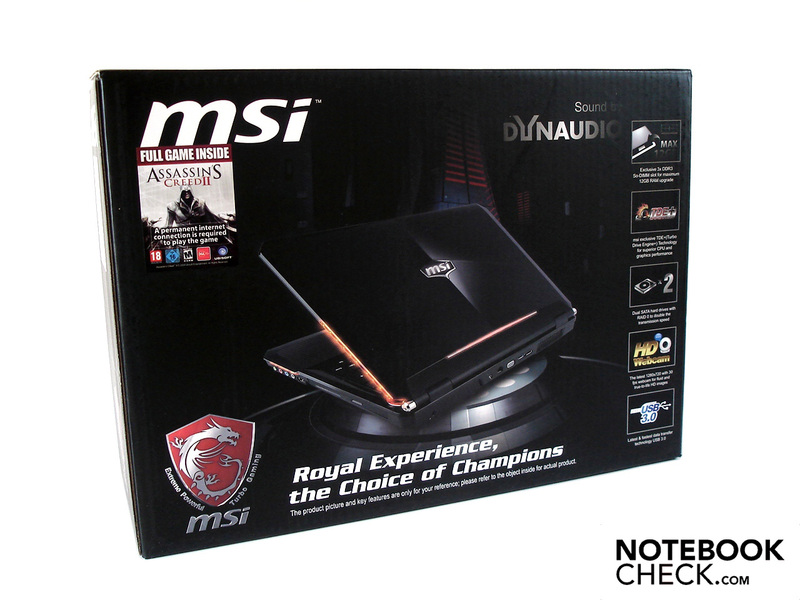 The MSI GT663R's gaming performance hardly leaves anything to be desired. Apart from extremely demanding games, like Metro 2033, the GeForce GTX 460M can usually cope well even with (very) high resolutions and details. There are even enough reserves for antialiasing. Ambitioned gamers will find a competent companion in the GeForce GTX 460M. First absolute performance enthusiasts won't get around a stronger graphic cards, such as the GeForce GTX 485M. In comparison to the ATI competition, the GeForce GTX 460M shows a good performance. Seen overall, the Radeon HD 5870 only has a slight lead. By the way, MSI's own Turbo mode partly had a negative impact on the speed during games. In Mafia 2, the average frame rate increased from 24.8 to 25.2 fps when Turbo Drive Engine was disabled. Apart from the average display, the high noise development is the main reason why the GT633R doesn't achieve a better rating. 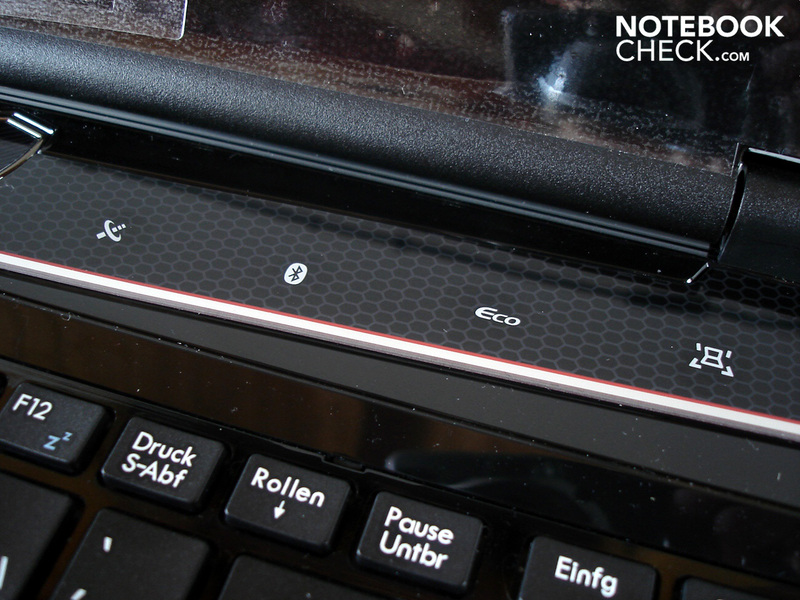 The notebook is anything but quiet even in idle mode. The hard disks and the case fan whirr along noticeably. The soundscape increases to a very audible level under load. Games are only not drowned out in very loud scenes (e.g. gunfights). When the 15 incher is put under full load (Furmark & Prime), the fan attracts attention with such a disturbing level that you won't want to put up with it. When Turbo Drive Engine is disabled, the GT663R runs a bit quieter. 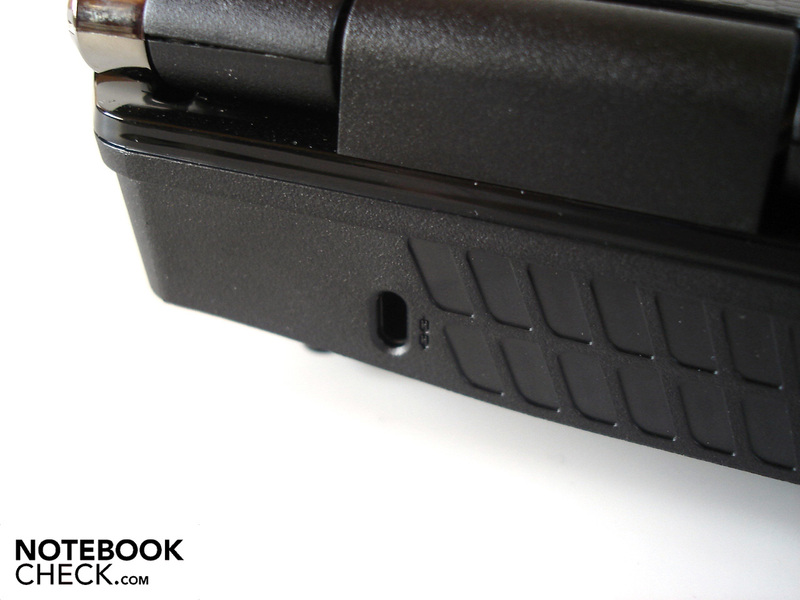 Nevertheless, noise sensitive users should keep away from this notebook. Asus has impressively demonstrated how to combine strong components and a moderate noise development successfully with its G73JH. There's a lot less to complain about in terms of temperature development. Since all case surfaces remain pleasantly cool under low load, you can work comfortably with the device for several hours. Especially the wrist-rest was a pleasant surprise in this regard. 30°C is not exceeded even under high load. 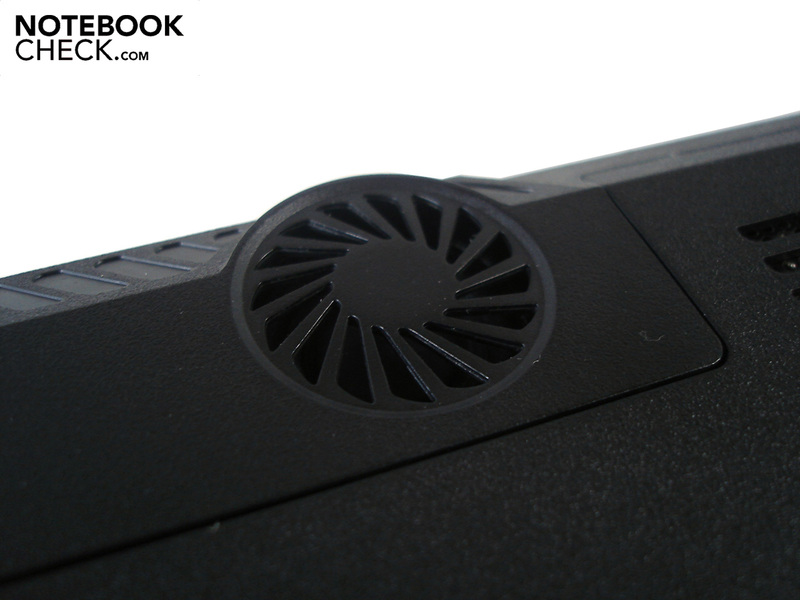 Merely the area around the case fan heats up very strongly under full load use. Our measuring device indicated about 53°C on the bottom. The components also prove to be acceptably tempered. The Core i7-740QM and GeForce GTX 460M settle to nearly 40°C in idle mode. Fairly high, but still not alarming, 81 respectively 85°C are reached under full load (Furmark & Prime). Enabling Turbo Drive Engine primarily has an impact on the processor. A maximum of 97 °C caused the Core i7-740QM to occasionally downclock to a meager 977 MHz (CPU throttling). MSI has collaborated with the company Dynaudio for the sound system. That this was a very good decision quickly becomes obvious in the GT663R. The installed 2.1 system (two loudspeakers & a subwoofer) is amazing right from the start with a surprisingly natural, clean and strong sound. Not only do explosions in movies and games delight you, but the bass is also audibly very present in music pieces due to the subwoofer. Moreover, the maximum volume proves to be unusually high. The soundscape is still very dominant even a few meters away. The GT663R can collect even more bonus points with its support for the multi-channnel sound system DTS (digital theater system). It can easily be modified to suit individual needs via Audio Manager (see screenshot). All in all, external speakers – in opposition to many other notebooks – aren't mandatory. 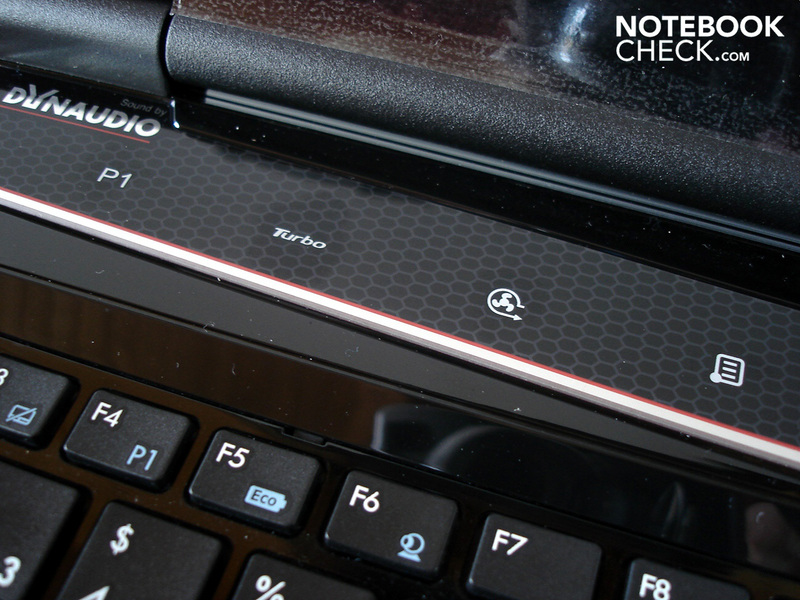 Only few devices, such as the Dell XPS 17, have a similarly good sound. 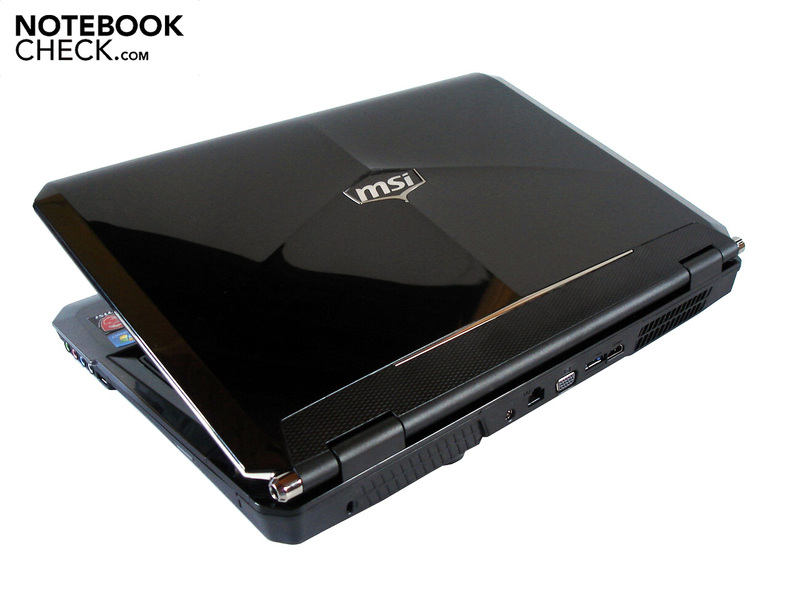 MSI supplies the GT663R with a strong nine cell battery (87 Wh, 7800 mAh), which provides adequate runtimes. More than three hours are possbile in low load when the brightness is reduced to the minimum value (BatteryEater's Reader's test). The wireless internet surfing time is also acceptable. We achieved about 2.5 hours with maximum brightness and moderate energy saving options. The battery life caves in even more in DVD rendering. Not quite two hours aren't enough for a blockbuster. 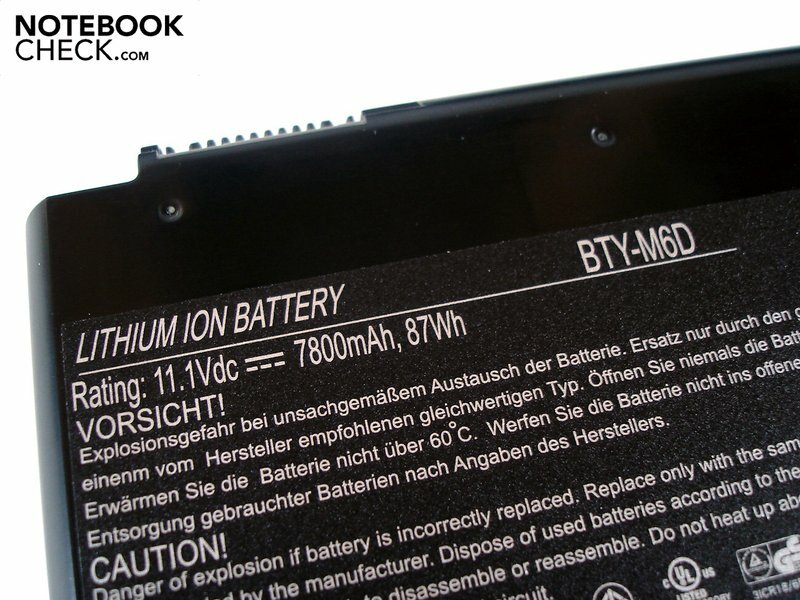 We finally executed BatteryEater's Classic test with maximum brightness and disabled energy saving options: 76 minutes are typical for a gaming notebook. Unsurprisingly, the GT663R's high-end components consume a fair amount of energy. The sister model, GX660R (Radeon HD 5870), consumption rates are almost matched with nearly 50 watts in idle mode and 120.7 – 165.6 watts under load. We have illustrated the power consumption with enabled Turbo Drive Engine in the following chart. 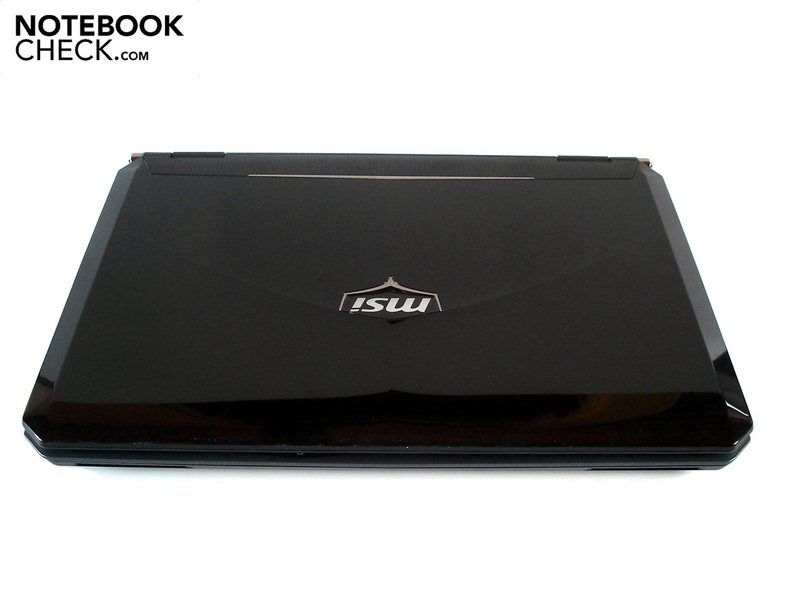 After finishing all tests, we can give the MSI GT633R good rates. The fairly scratch and smudge resistant 15.6 inch case isn't exactly light and petite. Nevertheless, the lavish connectivity is beyond any doubt (except for the lacking Firewire port). 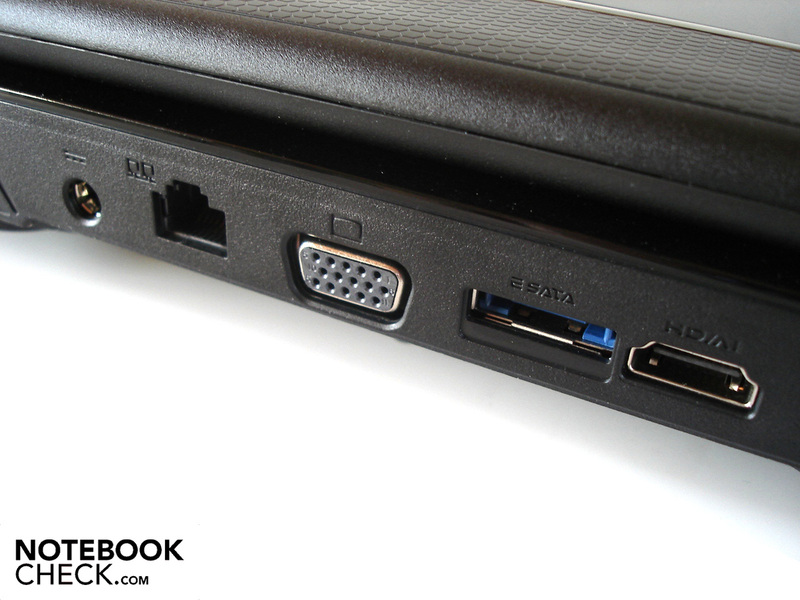 Additionally, large amounts of data can be transferred to an external medium easily due to two fast USB 3.0 ports. The sound is also above-average. 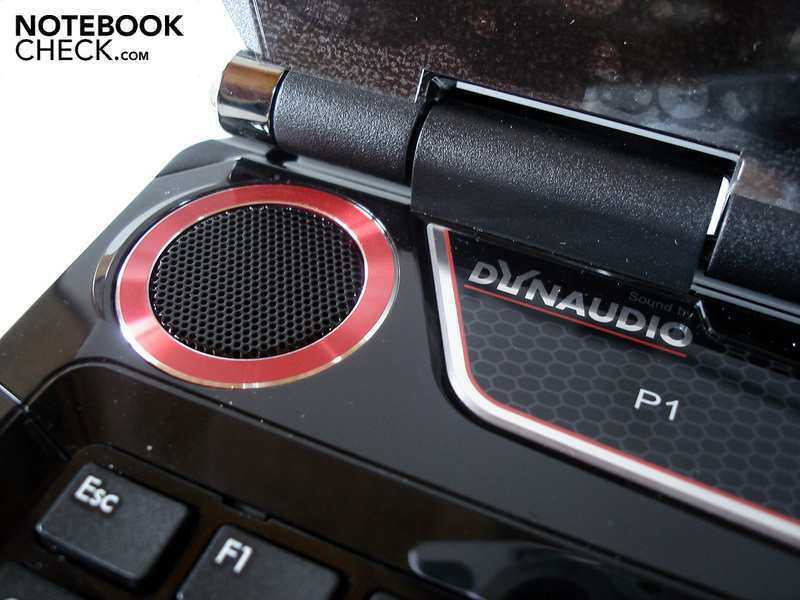 You only hear such impressive sound in the fewest notebooks. The GT663R's biggest advantage is its brute power. Nvidia's GeForce GTX 460M and Intel's Core i7-740QM create a very potent duo that deals with most fields of application successfully. Eight GB of DDR3 RAM and a RAID 0 array of two fast 7200 HDDs are another guarantee for high-performance. MSI still has to improve a few areas. The always present fan that especially gets on your nerves under load would have to be mentioned first. Beyond that, we would have expected a higher quality display at a price of around 1600 euros. The installed display isn't only disappointing with its high black value and low contrast, but also with quite limited viewing angles. A comment about the optional overclocking: The theoretically interesting Turbo Drive Engine proves to be a superfluous gimmick in practical use. The user has to accept unnecessary ergonomic losses in system noise, temperature and power consumption. Therefore our recommendation: simply ignore the turbo mode. 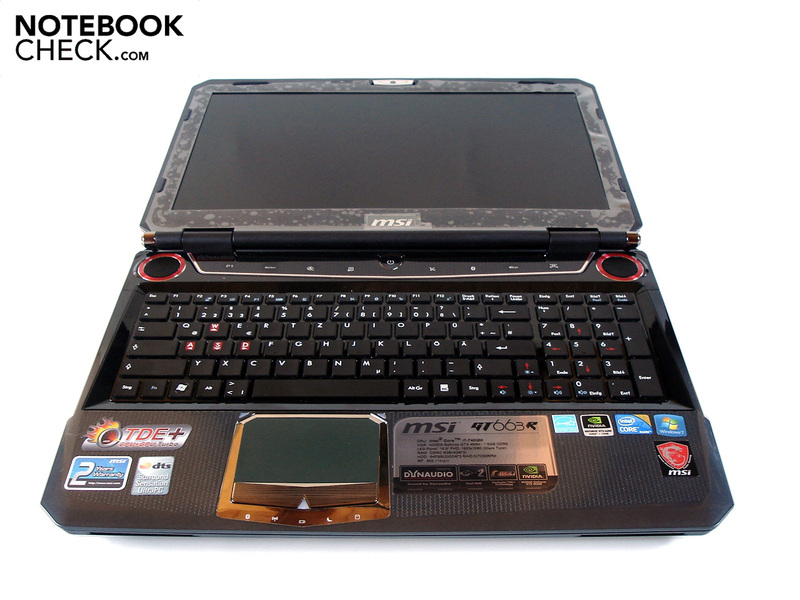 With the GT663R, MSI is generally aiming at gaming enthusiastic users who want to own a well-equipped, strong and fairly mobile gaming platform. However, buyers shouldn't have too high demands on noise development or the display. If 1600 euros is too pricey, you should take a look at Medion. The Erazer X6811-MD97624 bids a comparable performance for 1200 euros. If you don't want to forgo on the highest quality possible, you'll find something at the suppliers of Clevo barebones. The mySN XMG P500 Pro is superior to the MSI GT663R in many regards. The black high-gloss surfaces are very susceptible. The arrow keys are well sized. 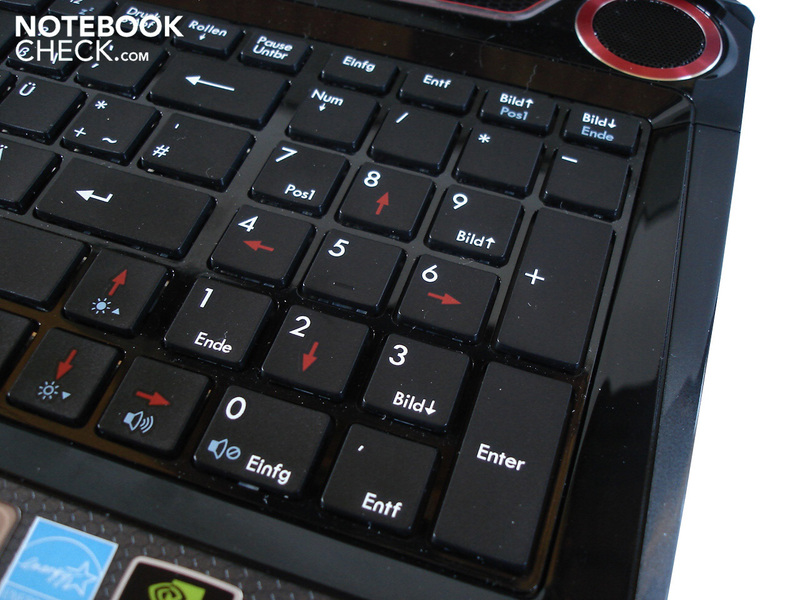 MSI has built-in a separate number pad. The warranty period adds up to 24 months. Cutting-edge high-end components assure a high-performance. 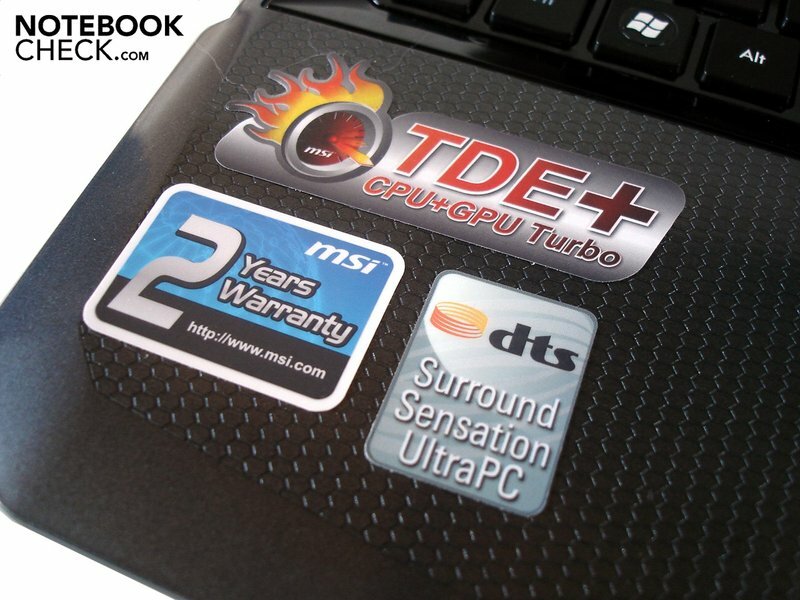 A sticker reveals numerous specifications. The silver touchpad rim smudges very quickly. A Kensington lock is found on the rear. The port distribution is adapted from desktop replacements. Two fast USB 3.0 ports earn high praise. A surround system can easily be used. 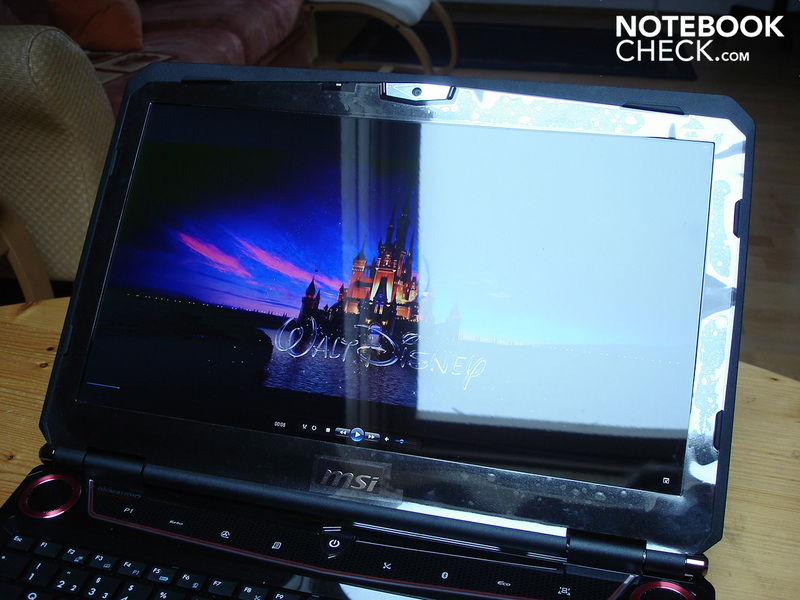 The notebook is available for about 1600 euros. The full version of Assassins Creed II is included in the scope of delivery. 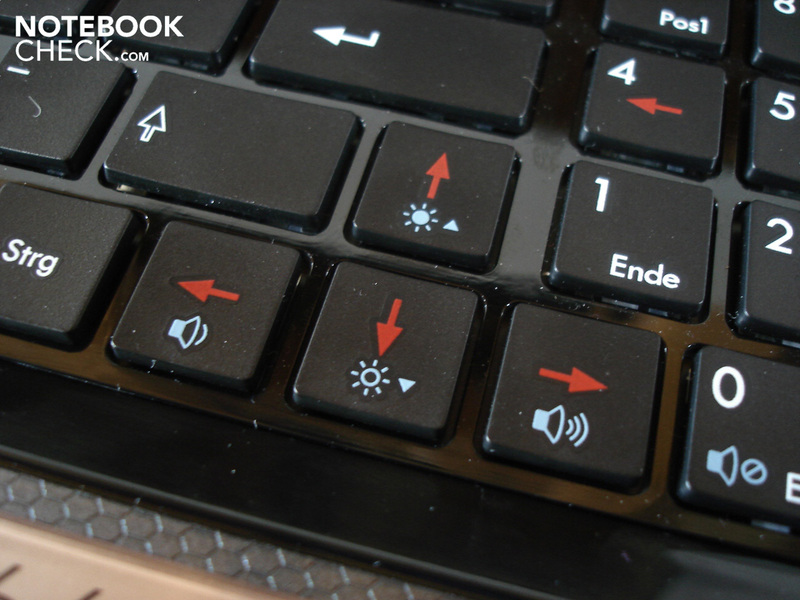 The installed lighting can be enabled/disabled via the right surface. 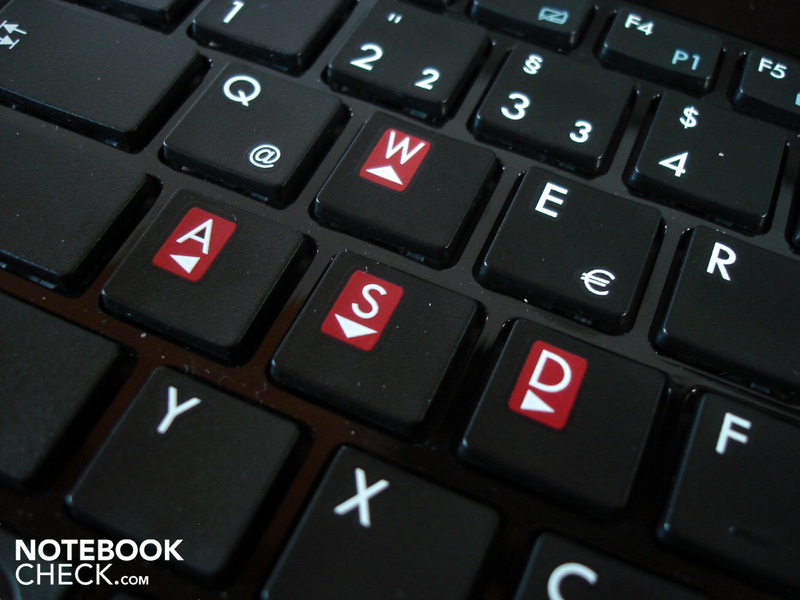 The WASD keys are marked in red. The GT663R's design is very obviously made for gamers. The 15.6 inch case weighs almost 3.5 kilograms. A maximum opening angle of 180° is rather unusual. The notebook lid is curvy. A BluRay player is used for the drive. The base unit doesn't lift when opening. 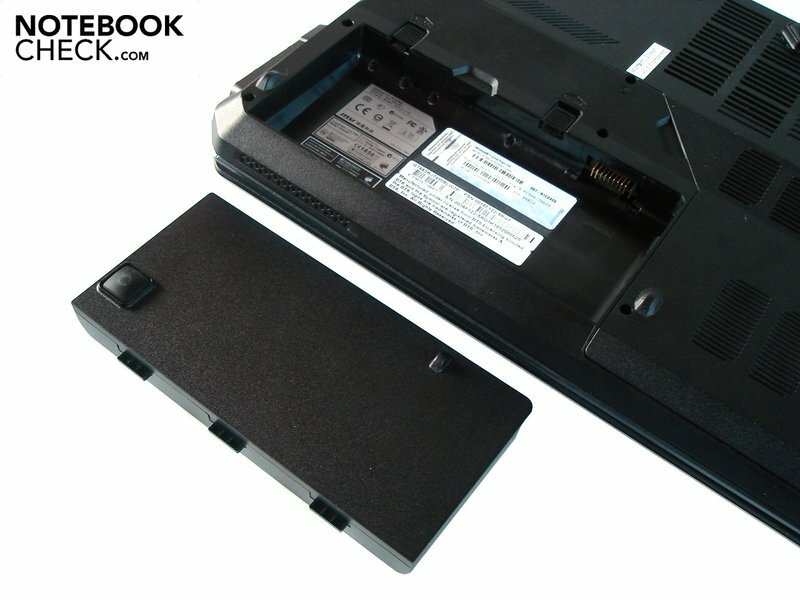 A large cover can be removed from the case bottom. 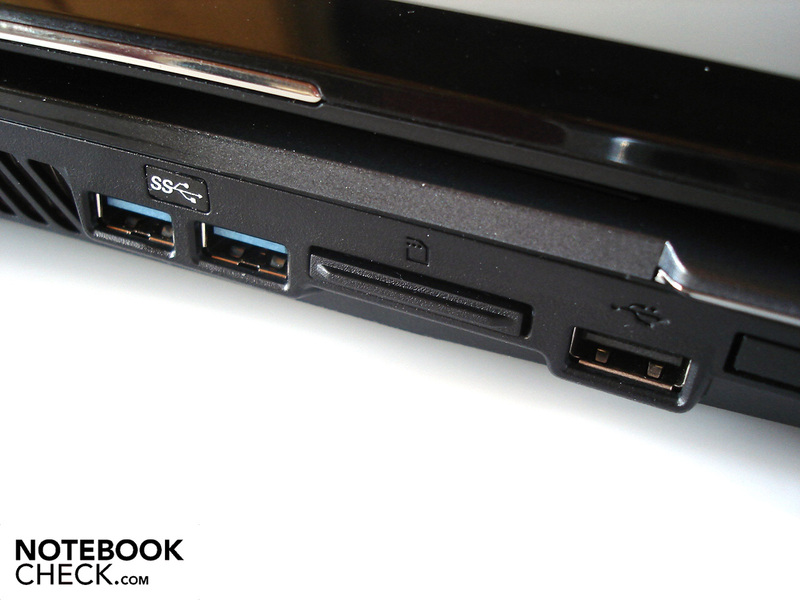 The notebook has a secure stance even without the battery. The battery life is rather average despite 87 Wh. A subwoofer is found on the case bottom. The speakers come from Dynaudio. Turbo mode supplies a little speed boost. The 150 watt adapter isn't exactly small. 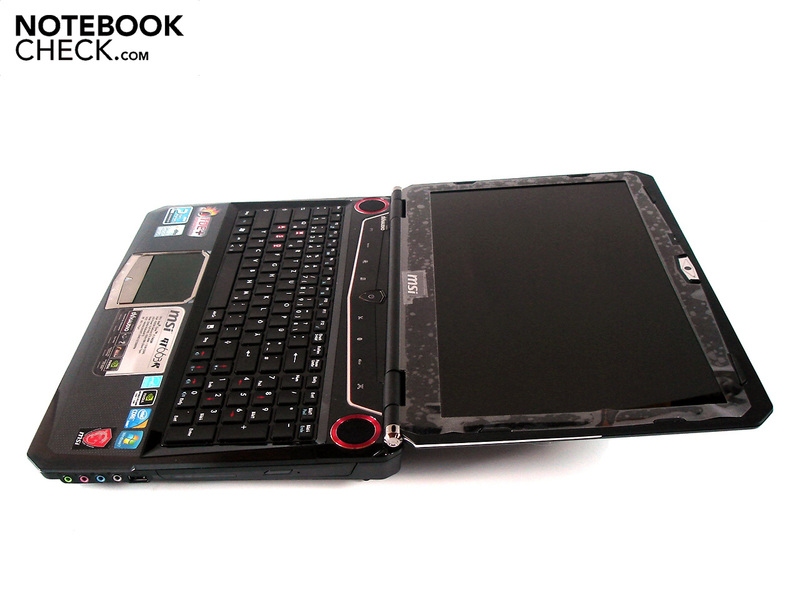 There are hardly any notebooks with such a good configuration. A better display and a quieter fan. The 2.1 sound system provides a perfect sound. 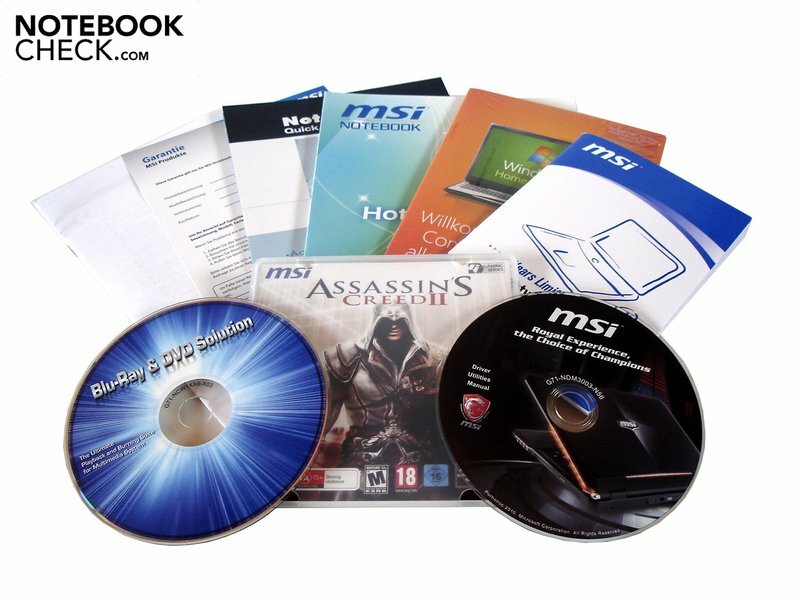 15 inch gaming notebooks with a GeForce GTX 460M or Radeon HD 5870, such as the Asus G53JW, the mySN XMG P500 PRO, the Medion Erazer X6811 or the MSI GX660R.